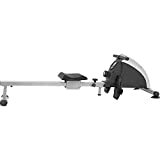 Perfect for anyone who is looking for a low impact, but highly effective exercise tool, rowing machines put no stress on your joints, protecting your back from undue stress, while delivering a total body workout. Rowing machines can be used to workout every major muscle group in your body, as with each stroke your legs, arms, shoulders, back, torso and core are engaged. An ideal tool for weight loss as during a tough, half our session on the rowing machine you can burn up to 400 calories. Improves cardiovascular fitness, strength, endurance, coordination and agility.